Cut your cost of racing! 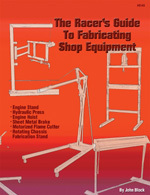 Build your own fabrication and repair equipment. How to build: rotating chassis fabrication stand, engine hoist, sheet metal brake, and motorized flame cutter. Full assembly instructions, materials list, and fully illustrated step-by-step directions for easy building. You can build all these tools for $500 - we did!